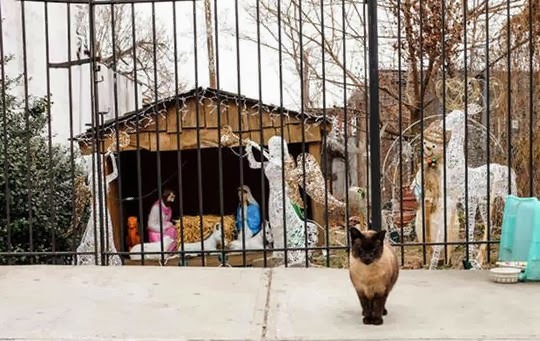 This Christmas nativity scene in Brooklyn, New York, has become a home to a colony of feral cats over the years. During the warmer months, the creche which houses the scene is placed in the back of the lot so the cats can stay. 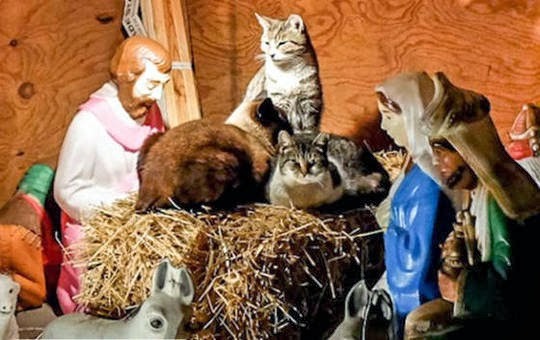 Once it's time for Christmas, both the nativity scene and the cats come out for everyone to see. It has become a popular attraction in Brooklyn. 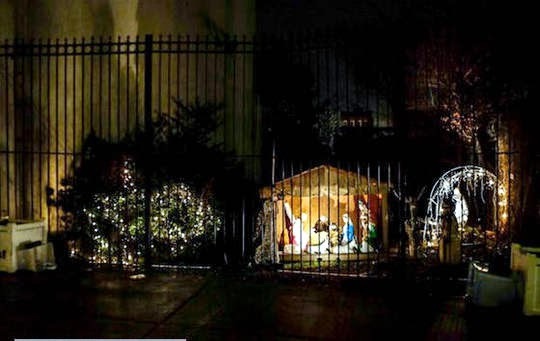 Behind this Christmas nativity scene are two sisters, Annette and Sue Amendola. They live next door to the lot and started with the project about a decade ago. The traditional nativity features statues of the Virgin Mary and Joseph kneeling in front of a hay bale that serves as the manger. 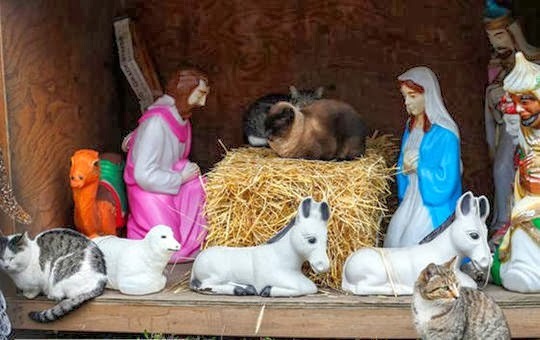 When the two sisters put out the statue of the baby Jesus on December 25, the cats oust him from his manger and take his place on the hay. 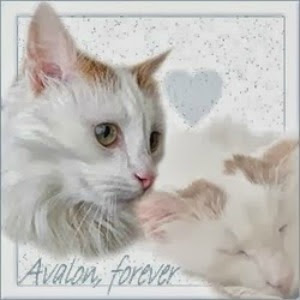 "People love it, but they really get a laugh out of the cats," Sue Amendola said. 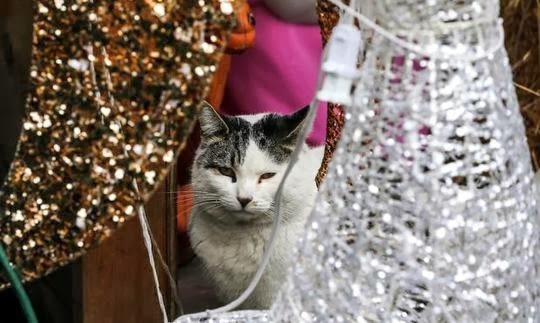 Do you want to see the nativity scene and its feral cats? You'll find them at 344 Van Brunt St. in Red Hook, Brooklyn, New York. Those traveling cats are really capturing my heart -- the Siamese reminded me so much of still-missed Chessy. About the algorithms: After the purchase of one book, Amazon's stats move slightly, then pause, waiting for the next purchase in order to move higher. 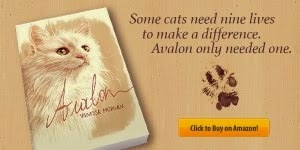 If not, the book sinks lower than where it opened, making it even more difficult to rise above entry level. No one knows the mathematical formula Amazon uses, but when a book launches, 'the monster' has to be regularly fed! You're going to pick up natural sales from your followers but you must also alert non-blogging fans about your release date and encourage them to purchase within a two- three-day period to kick the stats. Small indie authors rarely go beyond that period. Once you build a reputation, though, it's possible. AND, remember: those who write books don't necessarily buy books. Cultivate beyond writers' blogs or, basically, we're all selling to each other, not a good thing. Hope this helps! How precious! I'm glad the feral kitties have a warmer place to stay and they look so adorable here. 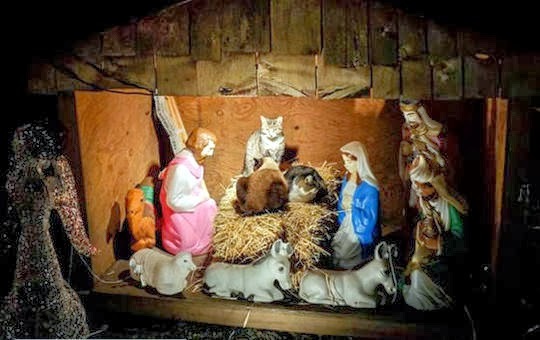 That is so sweet....the nativity with the cats. Wish they all had a loving home. I thought maybe the cats had kidnapped Baby Jesus and were holding him for ransom. Ils sont bien là ces chats. Ils donnent de la vie à cette crèche ! That's really cool. I love that it gives the kitties a warm place. I hope they leave it all winter. - Crepes. Great photos! Kitties found the best place to warm themselves up. A really thoughtful project! I was wondering where the cats sleep in the winter. Thanks for sharing this.